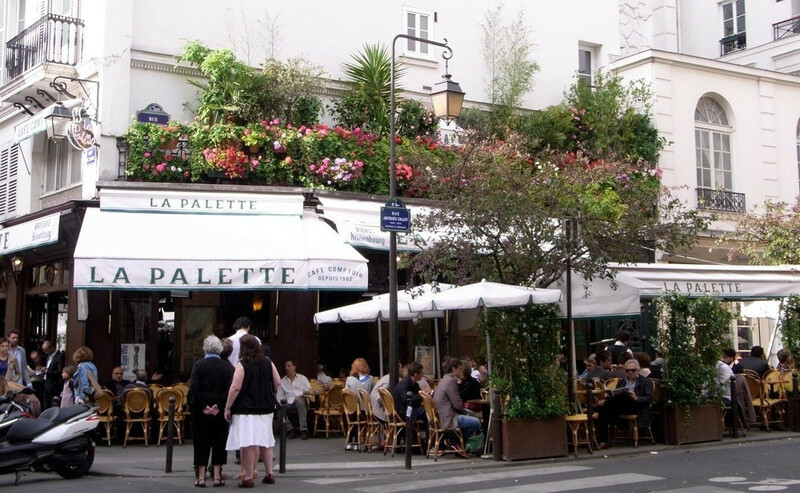 A stone's throw away from the Seine and the Beaux-Arts, close to a number of galleries, in the mythical district of Saint-Germain des Prés, La Palette is an institution whose success can not be denied. Located at the intersection of the rue de Seine and the rue Jacques-Callot, it has a large terrace where it is good daydreaming in the morning when the world is agitated and customers begin to arrive. Inside, two rooms, the largest of which, inscribed, like the facade, to the Historical Monuments, welcome a motley public come as much for the authenticity of the places, the decoration so french, as for a quality card. Here, mingle the classics of the bistro including smoked salmon rillette, a beef tartare, croque monsieur and madame or all the specialties to the egg as promised by the card. It is therefore always possible - and recommended - to taste wet mouillettes with a flowing yellow in a magnificent room decorated with ceramics from the 1930s-40s and many paintings in Paris! And it is probably this type of possible that makes the reputation of the place to the point of having seduced a few years ago Ernest Hemingway, Jim Morrison, Pablo Picasso or Harrison Ford and Julia Roberts who rested their seats on one of the bases from La Palette. Just that !